Kathleen Currie, a third-year doctoral student, was awarded a Graduate Research Fellowship Program grant by the National Science Foundation. 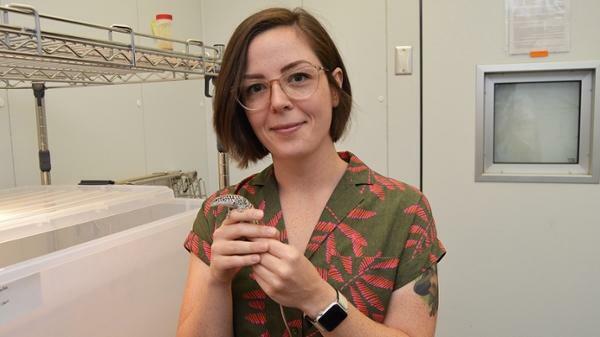 The award will support her research, which focuses on genetic variation and its impact on the microbiome, using whiptail lizards (genus Aspidoscelis) as the study system. "What makes this system unique, and the perfect system for my research, is the presence of both sexually and asexually reproducing species living in sympatry," she said. In biology, two related species or populations are considered sympatric when they exist in the same geographic area and thus frequently encounter one another. "By examining and comparing these sympatric species, we are hoping to gain a better understanding of the role host genetic variation has in the composition of their microbiomes," Currie said. "I got the email right after waking up, so I was pretty disoriented," she recounted. "I took a screenshot and sent it in our lab group message and asked if it meant what I thought it meant, because I didn't believe it. Even though it still doesn't quite feel real yet, I am immensely grateful to NSF for this opportunity and am excited for what the next few years hold." Matt Fujita, associate professor of biology and Currie's faculty advisor, said he is thrilled to see Currie's hard work pay off with the GRFP award. "Kathleen has completely earned this award on her own," Fujita said. "She supported herself through her education as an undergraduate at UTA and continues her academic excellence as a graduate student. "The GRFP will provide her the flexibility to make sure she reaches her research goals but also attain new ones that may not have been possible if she had to teach for an entire semester. I am excited to see the opportunities that open up for Kathleen via this award." "My favorite classes growing up were always science classes, and I loved to go outside and look for whatever critters I could find," she said. "While I didn't know quite what I wanted to do in the long run when I initially came to UTA, I knew I wanted to major in biology," Currie said. "I took biological anthropology my first semester here, and realized that I really enjoyed learning about genetics and evolution." Currie graduated in 2015 with a bachelor's in science in Biology. She spent the next year working as an academic advisor in the Department of Biology, and then started as a doctoral student in Fujita's lab in the fall of 2016. In the two years since, she has worked as a graduate teaching assistant in human anatomy and physiology courses in addition to conducting research on her dissertation project. "It can be a real challenge to catch them because they're so fast and agile," Currie said. The NSF Graduate Research Fellowships Program helps ensure the vitality of the human resource base of science and engineering in the United States and reinforces its diversity. The program recognizes and supports outstanding graduate students in NSF-supported science, technology, engineering, and mathematics disciplines who are pursuing research-based master's and doctoral degrees at accredited United States institutions.